Join Bilbo the Hobbit and the thirteen Dwarves led by Thorin Oakheart on their quest to recapture the lost treasure of their ancestors. He is now jealously guarded in the heart of the Lonely Mountain by the terrible red dragon Smaug. Throughout this perilous journey, you will face many enemies all more dangerous than the others; Giant Spiders, Trolls, Goblins, Wargs ... to name a few! It's up to you to embody one of the Dwarves of the Company and acquire skills to meet the many challenges that await you to fulfill your mission: recover as much treasure as possible from the claws of the Dragon! 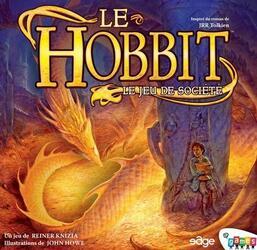 The Hobbit is a board game for the whole family that will make you relive the fabulous adventures of Bilbo.